The carpet is dirty, and this is the sole reason it is necessary to have it professionally cleaned. This is the thought of most people, and it is only one of several reasons to have carpets cleaned by Clean Pros Carpet Cleaning. Carpet is a notorious sponge for collecting all sorts of unpleasant unmentionables. Besides dirt, think bacteria, dust mites, allergens, mold spores and the like. Some, but not all, of these can be removed with vacuuming, but the average home vacuum cleaner lacks the suction and power to get the most stubborn of the soils and material. This means a constant stream of substances that are contaminating the air the family is breathing. 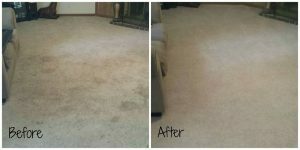 A carpet may look nice and clean, but there is more than meets the eye under the surface. Though not visible on the surface, these substances can actually contaminate the air that you and your family breathe while indoors. Carpets that often appear clean may, in fact, contain more particulates than you realize. Those who have allergies are particularly susceptible. Carpets are air filters on the floor. Substances build up and collect in the fibers and onto the mat of the carpet. Traffic will kick up particles into the very air you breathe indoors. Household cleaners are great for in-between professional services, but these are no replacement for the commercial grade equipment from Carpet Pros Carpet Cleaning. A professional cleaning is an investment in the home and health of the inhabitants. This also helps keep your carpet looking good as new for many years to come and minimizes the effects of heavy traffic in certain areas. 5. The carpet is ready as soon as it dries! Contact us for a free, no charge estimate. We will come out, visually inspect the carpet, measure the areas and give you a quote. You are under no obligation to accept our service offering.